If you’re searching for the best food delivery in Tampa, you can get some of the tastiest bites delivered to your door with Amazon Restaurants. Discover popular, local restaurants like The Cuban Sandwich Shop, serving tostones, plantains, picadillo, media noche, ropa vieja, and, of course, classic Cuban sandwiches made with Cuban-style pork, Genoa salami, and Swiss cheese. The city on Tampa Bay is also known for fresh seafood served up in grouper sandwiches, crab enchiladas, and garlic shrimp. This city is undergoing a gastronomic revival, so your food delivery choices span everything from food trucks to high-end restaurants. Vegans, vegetarians, and carnivores will find plenty to eat, too, especially on our menus from familiar favorites like Earl of Sandwich, Ruby Tuesday, Five Guys, and Olive Garden. Tampa is known for Busch Gardens, an African-themed amusement park with roller coasters and other rides and animal-viewing areas, where you can explore all day and come home to dinner on the table with a few clicks at Amazon Restaurants. Visitors and locals enjoy soaking up the historic Ybor City neighborhood, Lowry Park Zoo, Florida Aquarium, and taking boat tours to catch glimpses of alligators and other swamp life. Take a picnic packed with delivered food from your favorite restaurant and avoid pricey tourist restaurants. One great picnic spot is the revitalized Riverwalk along the Hillsborough River, with miles of trails. To get food delivered to your door, enter your ZIP Code to see which restaurants deliver to your neighborhood. 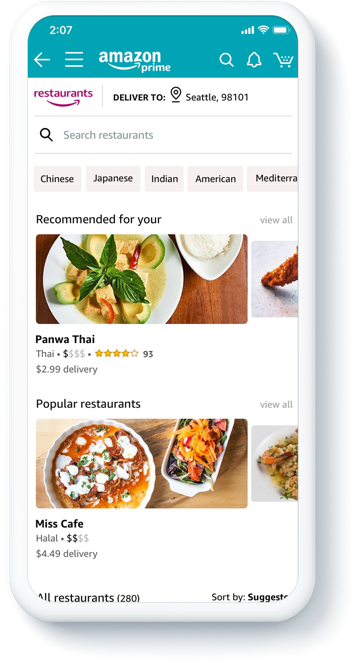 Browse by cuisine or restaurant, order, and track your delivery in real time. You can also order on the Amazon mobile shopping app or the Prime Now mobile app. Amazon Restaurants is available in select cities across the US, including Atlanta, Austin, Baltimore, Chicago, Columbus, Dallas, Houston, Irvine, Las Vegas, Los Angeles, Miami, Minneapolis, New York City (Manhattan/Brooklyn), Oakland, Orlando, Phoenix, Portland, Ore., San Diego, San Francisco, San Jose, Seattle, Tampa, and Washington, D.C. Go to www.amazon.com/restaurants and enter your ZIP Code to see if delivery is available in your area.